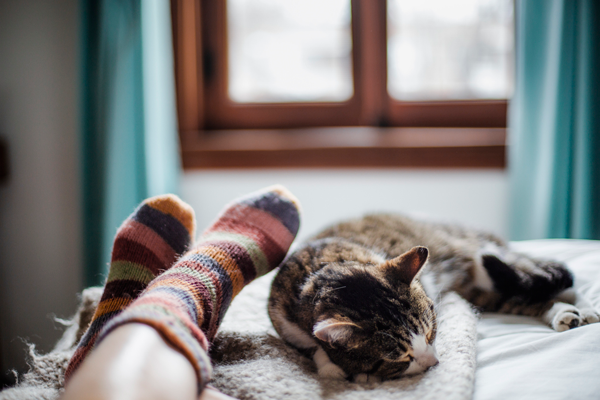 If you–like most households in America–have a pet, then you understand the satisfaction that comes from keeping a critter healthy and happy. Not all pets are cuddly (see: fish), but caring for them can be just as beneficial for us as it is to them. Pets give a sense of responsibility, can reward us with affection, provide fun photo-ops, and can even get us dates, according to Disney’s 101 Dalmations. In addition, recent research actually points to pets helping you live longer! 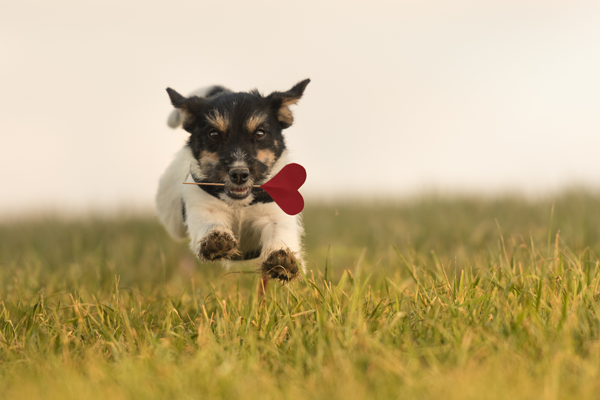 The American Heart Association (AHA) released a scientific statement in 2013 that stated pet ownership could be associated with reduced risk of heart disease and longer lifespan. However, their research leans toward the benefits of one particular type of pet in particular: dogs. While furry pets that are interactive with their owners are beneficial, dog owners are more likely to enjoy the last two benefits: increased opportunities for exercise and outdoor activities, and increased opportunities for socialization. Since most dogs require a lot of exercise for optimum health and behavior, it shouldn’t be a surprise that their owners tend to be more active than the average person. In fact, one study showed that those who walk their dogs tend to get at least 30 minutes more per day of exercise than those who don’t have a dog to walk. Go on a picnic. Pack some healthy snacks like fruit, veggies, mixed nuts, and plenty of water, including a bowl for your dog! Bring some fun toys like a frisbee or ball and play a game of catch. Cool off in the sprinklers. When it’s hot, grab swimsuits and sunscreen and run around with your kids and pooch in the cooling spray. Take a dip. If you live near a beach, lake or pool that is dog-friendly, bring your pupster along for a swim. Go for a walk. Participate in local fundraising walks or fun runs with the whole family. Check to make sure dogs are allowed. You’ll be getting active together while supporting a great cause. Coming up locally is the Sacramento SPCA’s Doggy Dash on April 27th. Park it. If your dog plays well with others, hit up the local dog park to toss a ball or just run with the pack. Play ball. Head outside anytime to enjoy some fresh air and a quick game of fetch or keep-away. Even if you only have 10 or 15 minutes to spare, you and your dog will get some exercise and bonding time. Get agile. Agility training can be fun and active for both dogs and owners. Many dogs—especially herding breeds—benefit from having a job to do, and learning agility skills can fulfill that need. Training equipment can be DIYed if you want to build your own backyard agility course. Walk home from school. 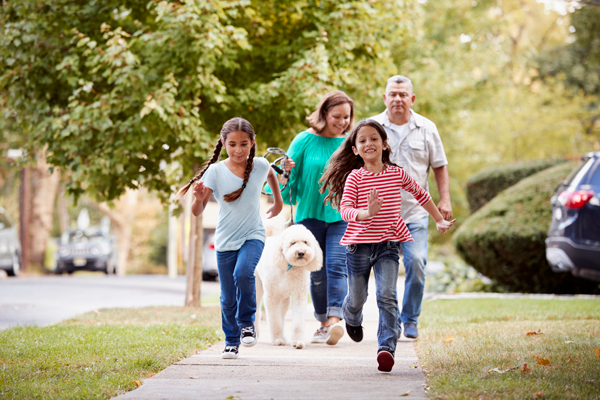 If your kids can walk home from school or a bus drop-off point, bring the dog to meet them and walk home together. While there are definitely health benefits to owning a dog or other pets, it’s just one part of a healthy lifestyle that includes a sensible diet and regular movement. Adopting or rescuing a pet should be done with the animal’s best interests in mind, to provide it with a loving home and companionship. Gaining the motivation to build healthy new habits is something that a pet can’t do for you. But if getting a pet will help you move more, then it’s a mutually beneficial arrangement! At California Family Fitness, we’re committed to helping you incorporate healthy activities into your day year round. If you’d like to learn more about becoming a member and enjoying the amenities at any of our 20 locations in Greater Sacramento, you can click here to get a personalized quote.